We want to hear from you! Fill out our Dine-In Survey and get a FREE appetizer! 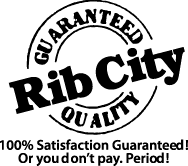 Get in all the fun by joining Rib City's R.I.B. Club (really into BBQ club). Had take-out recently? Fill out our Dine-In Survey and get a FREE appetizer!